JBL Arena 5.1 review | What Hi-Fi? JBL’s Arena 5.1 is the company’s newest, most affordable speaker package. Following a commendable four-star First Test, we’re familiar with the Arena 170 floorstanders in this set-up, but can the 5.1 package match – or even better – their solo performance? 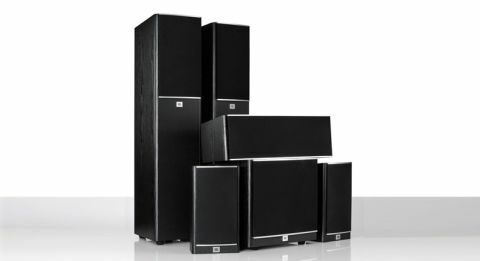 The set-up comprises the 170 floorstanders (£460) and 120 standmounters (£180) with the Arena 125C centre speaker (£180) and Arena SUB100 (£260). There’s also a pricier floorstander and standmounter option if your budget can stretch another £80. The scale on offer here is larger than we would expect at this price, especially when you consider the range’s relatively compact design. The Arenas are the perfect match for explosion-filled action movies, so we load up Edge of Tomorrow to see how they handle its hefty soundtrack. Immediately, the Arena 5.1 hits us with an exciting, dynamic performance that’s powerful and immense. Explosions are delivered with authority and stacks of low-end rumble – a credit to the sub. Sound placement is good too. When Tom Cruise’s character, Cage, is dropped into the warzone for the first time, gunfire and the sound of helicopter blades fly around your listening position with natural fluidity. Meanwhile, the midrange handles the tense horn-based soundtrack with urgency and agility. When Cage battles the alpha Mimic, the noise as the timeloop explodes spreads impressively tall and wide, emphasising just how big a soundfield this system has to offer. We play with the centre speaker’s levels to get it to integrate with the two fronts – at first it sits slightly forward and is a touch overpowering, before tipping the other way when turned down. We find a happy medium, but there is a slightly different character between them that our tweaking can only do so much to balance out. For all its big, bold characteristics, we think the JBL Arena 5.1 could do with a touch more refinement. While there’s a clarity and crispness that contributes towards the package’s keen and engaging nature, the extra edge to the treble can make the overall performance sound a little coarse. It’s not that the treble is forward or unbalanced, it just needs to be of a higher quality. A touch more subtlety wouldn’t go amiss either. The JBL Arena 5.1 is all about going hard or going home. Big scale dynamics are impressive, but lower level ones somewhat lacking. We’d like to see more fine detail to deliver better expression and emotion in dialogue-filled scenes. Here, the rival Dali Zensor 1 5.1 package takes easy points off of the JBL, with its more articulate and insightful nature. As for design, JBL has kept things simple. This doesn’t look as premium as the Dali package, but the humble look will suit those who prefer their speakers more unassuming, plus the choice of black or white wood veneer finish will work for most. The look of the speakers with the grilles removed would suggest this is not a package that’s been designed to go baffle-free though – they are functional looking to say the least. Still, it’s the performance that counts, and all of the speakers feature JBL’s waveguide design on the 25mm soft-dome tweeter that is claimed to deliver better-controlled dispersion, and to good effect. Supporting this on the 170 is an 18cm fibre-composite driver, while the 125C and 120 offer dual and single 14cm drivers respectively. The sub features 100w of Class D amplification with 25cm woofer at its heart. When it comes to positioning, we find the JBL Arena 5.1 works well with the front speakers toed in slightly towards the listening position, creating a stable, solid soundfield with no gaps. As ever, it’s always worth experimenting with placement to best suit your room though. The JBL Arena 5.1 is a hugely entertaining speaker package and a great companion to an action-packed film fest. That said, its unrefined nature and slightly less articulate managing of low level dynamics means it isn’t always the easiest, or the most expressive of listens. We’d like more subtlety and attention to detail to balance out its dynamic, fun side in order to give this set-up the full five stars.